The article presents the results of the rescue archaeological excavations carried out at the medieval settlement found at site N 5. The settlement is situated to the south of the village of Dragovishtitsa, Kostinbrod municipality (Fig. 1). The results of the excavations revealed cultural layers related to three periods: Early medieval period, Late Roman period (the 3rd –4th century) and Early Bronze Age. A stone oven (Fig. 5) and two concentrations of stones (Figs. 6, 7) dated back to the medieval period were excavated. The structures yielded comparatively small amount of finds (Fig. 8). It is worth mentioning a shoe applique and a fragment of a silver lining. The rest of the artifacts include household objects, such as lead weights for fishing nets, bone awls, a knife and spindle whirls. This suggests that the local population’s activities included spinning and river fishing. The unearthed arrowheads reveal the use of light weapons. Regrettably, none of the artifacts found at the site could be used for more precise dating. The pottery is the most numerous group of artifacts (Table 1). There is turned ware – jars made from sandy clay, decorated with incised wavy and straight horizontal lines (Figs. 10, 11). The problems of the dating and the ethnic and cultural identification of the settlement are studied in a broader discourse related to the date of the turned ware. 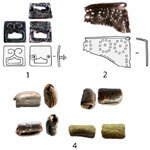 Numerous similarities have been identified with ceramic assemblages, which date the artifacts to the second stage of the Slavic invasion to the south of the Danube. The topographic characteristics of the settlement, its location very close to the river bank, the houses with stone ovens, whose house pits are quite shallow, and the short period of the settlement’s functioning are elements of the settlement pattern associated with migration in the 7th century.